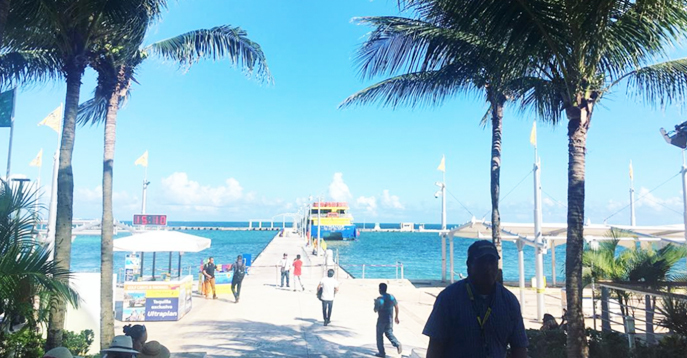 Discoverymundo makes it really simple to transport travelers arriving or departing from Cancun International Airport to Isla Mujeres Ultramar Puerto Juarez Ferry or any other specific place in the Isla Mujeres area. Ultramar is a maritime transportation company with more than 30 years of experience and innovation. All the local people and travelers from other parts of the world have been enjoyed trips from Ultramar. Each year the service has been improved and we recommend it. It is the best option in terms of time and comfort when crossing to Isla Mujeres. Each ferry has been designed and manufactured by the overseas specialists; together with the Midship Marine team in New Orleans, USA, and Incat Crowther. The ferry is made of aluminum with ecological engines for the care of marine life. How is the experience since I arrived at Ultramar in Puerto Juarez? Once you arrive at the station, you will see on your left an Oxxo store where you can buy some snacks or water for the road, on your right side you will find a Scuba Diving store for lovers of this sport. Further ahead you will find a food court, a little bar and a restaurant with tacos and seafood. If you arrived early and your ferry still needs to arrive you can buy yourself a drink and rest for a few minutes. What happens if I arrive with suitcases? Do not worry! There are porters helping travelers carry their bags and direct them to the trunk of the ferry. Can I buy the Ferry Tickets at Ultramar Puerto Juarez Ferry? Of course, right at the entrance on the right side, you will find a counter where you line up and you can buy your tickets, they accept credit card until 6 PM, cash in Mexican pesos and US dollars. Apart from the food court, the purchase of ferry tickets, a minimarket for snacks you will find also a mini store of swimsuits, souvenirs, and other useful accessories for the beach, in case you are interested, they are inside the counter where you buy your tickets. Does Ultramar Ferry close because of the weather? Yes, when there are thunderstorms or some kind of hurricane, normally close it for about 1 hour depending on the weather, there are very safe ferries where passengers are transported in these cases of rain, they are completely closed, it seems as if you go on a submarine! How is the Transportation from Cancun International Airport to Isla Mujeres with Discoverymundo? Once you are online, write Cancun International Airport and your location to Isla Mujeres, you will see several options depending on the number of passengers. After selecting the transportation to Isla Mujeres you will have to write all your arrival/departure information. We will confirm this information and track it until you arrive at Cancun International Airport. After meeting the representative at the terminal, he will guide you to your vehicle in the parking area of the Terminal. 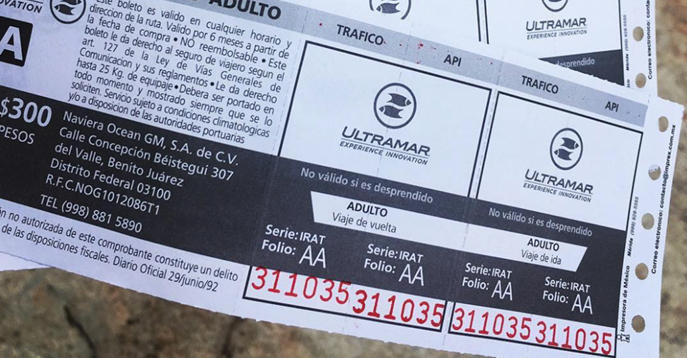 Once you are in the vehicle it will take 30 minutes to arrive at Ultramar Puerto Juarez Ferry, this is the time that the ride takes without any kind of traffic. 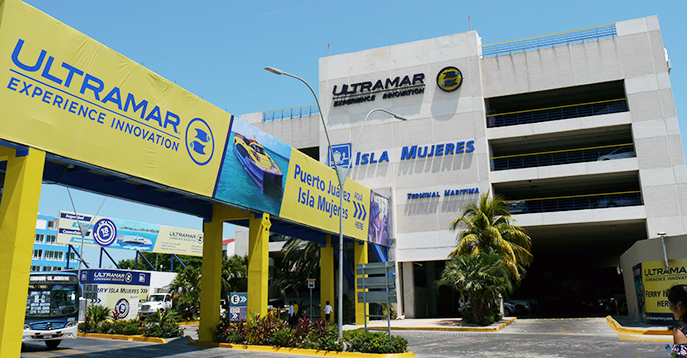 After arriving at Ultramar Puerto Juarez Ferry, the driver will park and help you with your bags, you can ask him any kind of information you need to buy the Ferry Tickets to Isla Mujeres or on how to get to the Ferry safe and on time. The ferry is available every 30 minutes. What do we recommend? We highly recommend to Pre-book your roundtrip Ferry tickets to Isla Mujeres and a cold drink for a smooth ride to Isla Mujeres from Cancun International Airport. The driver will provide the roundtrip Ferry Tickets in your arrival at the airport, we sell them in 23 USD round trip per person and you can use them any date at any time. What is the duration of the ferry from Port to Port? 25 minutes. Where are other routes from Cancun to Isla Mujeres? Playa Tortugas, El Embarcadero and Playa Caracol. What are the minor’s policies? Children up to 1.20 m tall, pay an adult ticket. Children under 1 year, do not pay a ticket (require boarding ticket). At what time will I find my driver at Ultramar Puerto Juarez Ferry on my departure pick up? It will be 3 hours before your flight, the time will be in your confirmation email. Can I change my departure pick up from Ultramar Puerto Juarez Ferry to Cancun Airport? 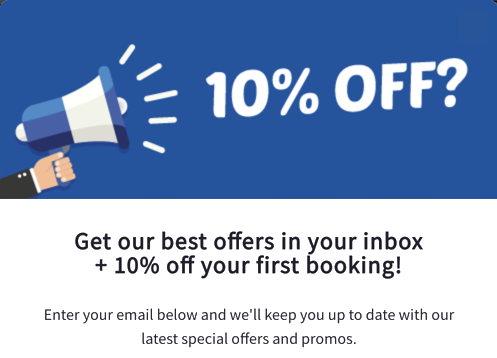 Yes, just write to us or call us with time, tell us the time you want to change it and make sure you receive your confirmation to your email with that information. How long is my ticket valid? This ticket is valid on any date and hour and for any route direction. Shuttles between the airport and Juarez Ferry seamless. Even when we had a little confusion over which terminal our flight was leaving from our driver was accommodating, helpful and cheerful. Check in via email an excellent feature. The instructions for the Cancun Airport saved us from being overwhelmed by the onslaught of people trying to sign us up for other transport. Great clean car, nice driver, on time! Recommended shuttle service from the airport. We needed to get to and from Puerto Juarez ferry terminal and it went very smoothly. Pick up was smooth considering our flight was delayed by over an hour. We went through the Cancun Airport as per Discoverymundo's instructions and found our driver patiently waiting for us in the area they said he would be. Drive through Cancun was very comfortable in the air conditioned van, pleasant conversation, (in English), and our tickets onto the ferry were included in the price. No problems at all and our driver was very helpful. Would definitely use this service again. BE AWARE to follow the instructions regarding the Cancun Airport very closely as this Airport is well known for its many scams. My Mother was scammed on another trip by unscrupulous "taxi" drivers who ripper her off by posing as legit drivers for the Marriott Hotel. Do not go with anyone who approaches you unless they are holding a sign with your name and/or are in the designated meeting spot AND, you approach them first. Very good service. Will definitely use again next time we visit. Saw driver at Puerto Juarez Marina shed if my pick up time so he was there to pick up other people, checked list and did not see my reservation or name so he called dispatcher. After a few minutes he offered to take us to airport and I gues other driver took his expected pickup. He was very humble, friendly and engaging not to mention funny also. I would not hesitate to use your services in the future. Went off without a hitch. Great drivers and helpful. Would use them again.